Razib Khan of course believes that race is not a social construct, and that race is not only real but predictive of intelligence. And yet I have found that in spite of the title of his article "Why race as a biological construct matters" he in fact failed to demonstrate the existence of race as a biological phenomenon. As always with the evo-psycho bros, Coyne engages in the most blatant straw-manning. Yes, you can distinguish Scandinavians from Italians. And these days both are considered members of the "white race." And thus we see that when people say "race is a social construct" almost everybody except Jerry Coyne understands they do not mean "ethnic groups are a social construct." It's hard to tell if Coyne is honestly confused on this point or if he is deliberately ignoring the difference in classification between ethnicity vs. race. In any case, as so often happens with the evo-psycho bros, Coyne wins his argument by misrepresenting what his opponents believe. "There is a widespread myth that there is no such thing as ah race, whatsoever, that it is purely a social construction." Here he is on Twitter, referring to an article in the right-wing/libertarian Marx-phobic Quillette. 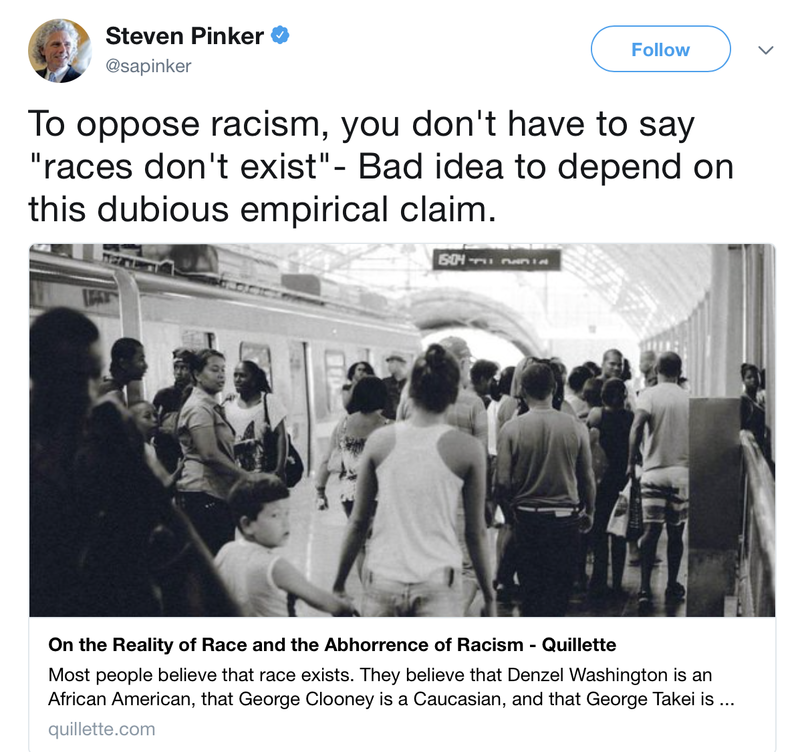 I have so far been unable to discover what Steven Pinker thinks "race" actually is. One plausible explanation is that he outsources his thoughts on race to Razib Khan and Steve Sailer, as I discuss in two recent blog posts, and lets them take the career debits while Pinker keeps his base of fanboys who like to think of themselves as pro-science and skeptical and not-racist. So once again, Pinker outsources an explanation for race to someone else. I will review this Quillette article tomorrow. There's no reason to believe that Steven Pinker has any disagreements with what it has to say about race.